Hans Poelzig (30 April 1869 – 14 June 1936) was a German architect, painter and set designer. Poelzig was born in Berlin in 1869 to Countess Clara Henrietta Maria Poelzig (daughter of Alexander von Hanstein, Count of Pölzig and Beiersdorf) while she was married to George Acland Ames, an Englishman. Uncertain of his paternity, Ames refused to acknowledge Hans as his son and consequently he was brought up by a local choirmaster and his wife. In 1899 he married Maria Voss with whom they had four children. Hans Poelzig was buried in the Old Cemetery in Berlin-Wannsee. On 18 November 2015, Friedrichstadt-Palast Berlin inaugurated a memorial at Friedrichstraße 107 dedicated to the theatre’s founders, Max Reinhardt, Hans Poelzig and Erik Charell. In 1903 he became a teacher and director at the Breslau Academy of Art and Design (Kunst- und Gewerbeschule Breslau; today Wrocław, Poland). From 1920-1935 he taught at the Technical University of Berlin (Technische Hochschule Berlin). Director of the Architecture Department of the Prussian Academy of Arts in Berlin. 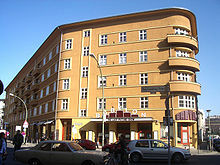 After finishing his architectural education around the turn of the century, Poelzig designed many industrial buildings. He designed the 51.2 m tall Upper Silesia Tower in Posen (today Poznań) for an industrial fair in 1911. It later became a water tower. He was appointed city architect of Dresden in 1916. He was an influential member of the Deutscher Werkbund. With his Weimar architect contemporaries like Bruno Taut and Ernst May, Poelzig's work developed through Expressionism and the New Objectivity in the mid-1920s before arriving at a more conventional, economical style. In 1927 he was one of the exhibitors in the first International Style project, the Weissenhof Estate in Stuttgart. In the 1920s he ran the "Studio Poelzig" in partnership with his wife Marlene (Nee Moeschke) (1894–1985). Poelzig also designed the 1929 Broadcasting House in the Berlin suburb of Charlottenburg, a landmark of architecture, and Cold War and engineering history. Poelzig's single best-known building is the enormous and legendary I.G. Farben Building, completed in 1931 as the administration building for IG Farben in Frankfurt am Main, now known as the Poelzig Building at Goethe University. In March 1945 the building was occupied by American Allied forces under Eisenhower, became his headquarters, and remained in American hands until 1995. Some of his designs that were never built included one for the Palace of the Soviets and one for the League of Nations headquarters at Geneva. In 1933 Poelzig served as the interim director of the Vereinigte Staatsschulen für freie und angewandete Kunst (United State School for Fine and Applied Art), after the expulsion of founding director Bruno Paul by the National Socialists. Poelzig died in Berlin in June 1936, shortly before his planned departure for Ankara. ^ "Kino Babylon". slowtravelberlin.com. Retrieved 20 April 2018. Dawson, Layla (May 2008). "Prolific Poelzig". The Architectural Review. CCXXIII (1335): 96–97. Wikimedia Commons has media related to Hans Poelzig.